Page added in June 2010. The city of Apamea was protected by a 4 mile long wall which included the acropolis. 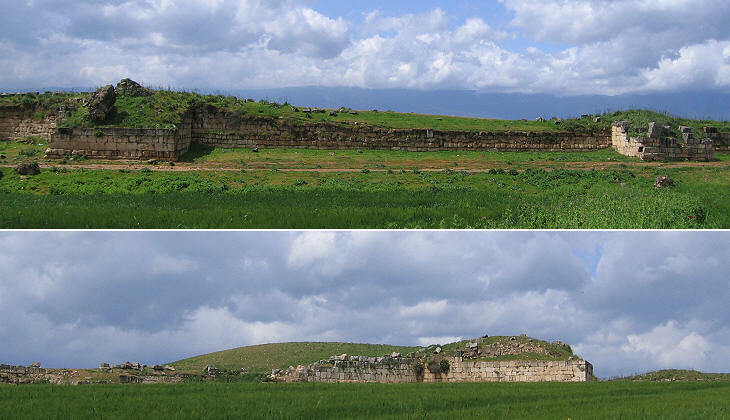 The walls were built at the time of the Seleucid Empire, but they were modified several times; there is indication that they were strengthened in the IIIrd century and yet in 252 the Sassanids managed to shortly occupy Apamea. 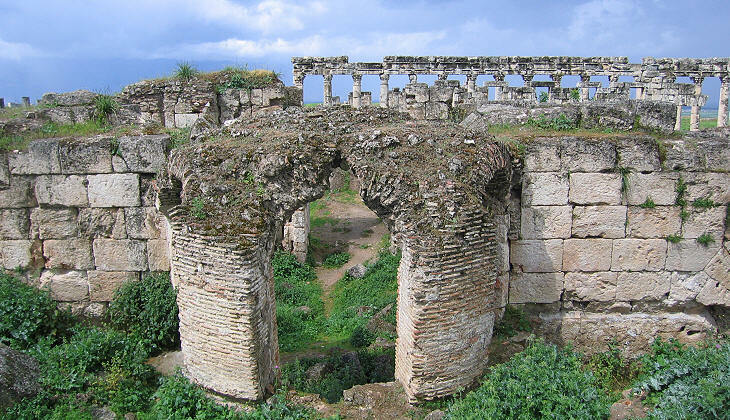 The walls protecting the northern part of Apamea were rebuilt and strengthened by Emperor Justinian after two earthquakes in 526 and 528. Today the ancient walls are mainly visible in the north-eastern sector of the archaeological area. 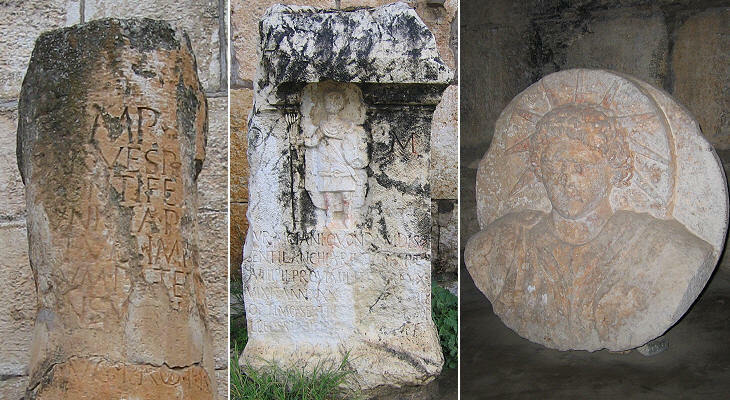 In the late IVth century Apamea became the see of an important bishopric; a shrine was built on a previous building to house a most precious relic: the True Cross. After the earthquakes of the VIth century a new complex of Christian buildings including a cathedral replaced the shrine. In 392 Emperor Theodosius declared the Christian faith the sole religion of the Roman Empire in the belief that this decision would have brought unity and strengthened the empire; theological rifts however caused such animosities among the followers of different doctrines, that the Arabs were almost welcomed when they conquered Apamea and the whole of Syria after the 636 battle of Yarmuk. The Arab conquest brought to an end the history of ancient Apamea, which lost its strategic importance and its religious power of attraction. Byzantines, Crusaders and the Emirs of Aleppo continued to fight for control of the citadel, whereas the city at its feet was gradually abandoned. 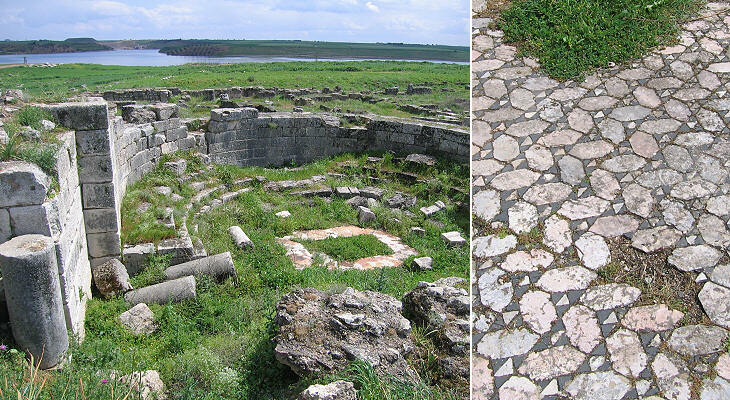 Archaeologists however have found evidence that a fine patrician house near the Eastern Cathedral was inhabited until the Xth century. 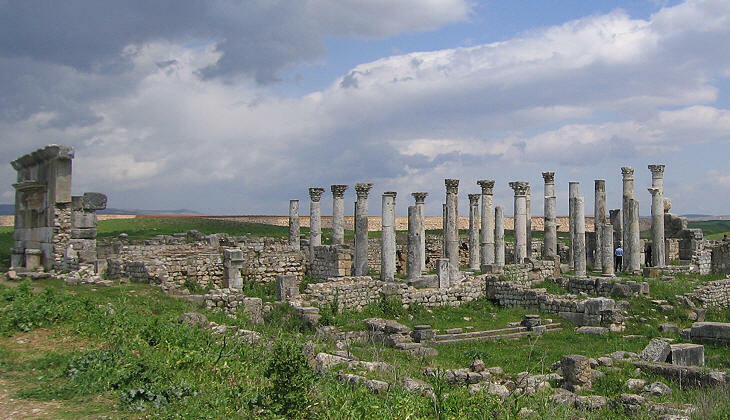 Most likely two strong earthquakes in 1157 and 1170 were key factors in convincing the remaining population to quit Apamea. The most interesting patrician house which has been reconstructed owes its name to the consoles which supported a flat roof; similar to traditional Roman houses it was structured around a peristyle, a columned porch surrounding a courtyard. The remains of large baths have been found between the colonnade and the eastern walls in the northern part of Apamea; next to the baths archaeologists have identified a peristyled courtyard which most likely was a palestra; the complex was supplied by an aqueduct which reached Apamea near its northern gate. 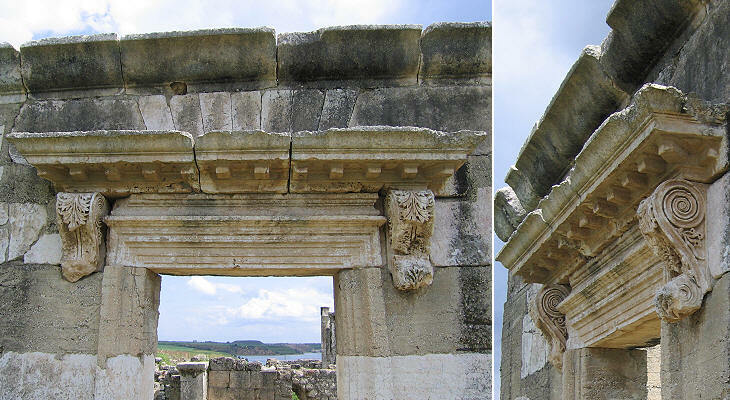 Other baths, built by Lucius Julius Agrippa, a wealthy citizen of Apamea, have been found opposite the agora in the central section of the colonnade. 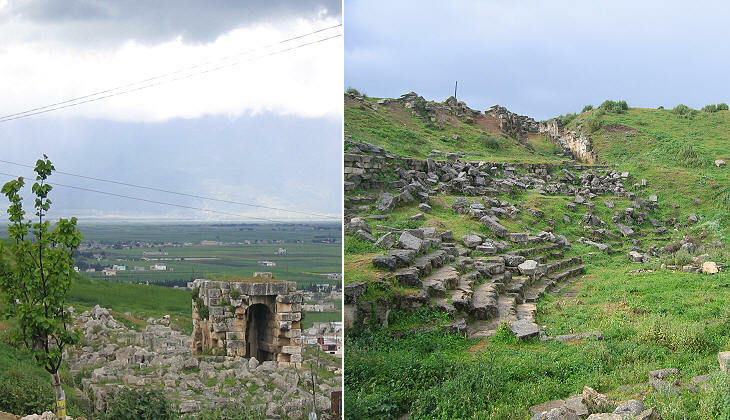 Archaeologists have measured the theatre of Apamea and found that it is the largest of Syria; it was rebuilt after the 115 AD earthquake; it is much ruined because it was used as a quarry for the construction of the village in the former citadel and of a large khan (inn for travellers) located below. Some of the works of art and records found at Apamea are housed in a former khan; they help in understanding the history of the city, its importance as a key garrison and the development of religions, such as the cult of Sol Invictus, which were highly popular among the soldiers. The warehouses and stables of the khan have not been appropriately equipped for displaying some very interesting mosaics and in particular two IVth century mosaics which were found under the Eastern Cathedral and which decorated a patrician house; they show that the city had still strong links with the Hellenized pre-Christian world; Apamea was the site of a school of Neoplatonic philosophers founded by Iamblichus at the beginning of the IVth century; the mosaic showing Socrates and his disciples is perhaps a metaphor for Iamblichus and his followers; its design resembles the Christian depiction of the Last Supper. A large khan at Maaret an-Nouman, some 20 miles north of Apamea, houses another collection of Roman mosaics; luckily in this museum mosaics can be appropriately observed because some of them hang on the walls and the rooms have sufficient light. A cycle of large mosaics portraying episodes of the life of Hercules shows an impressive level of skill in mastering very complex scenes. 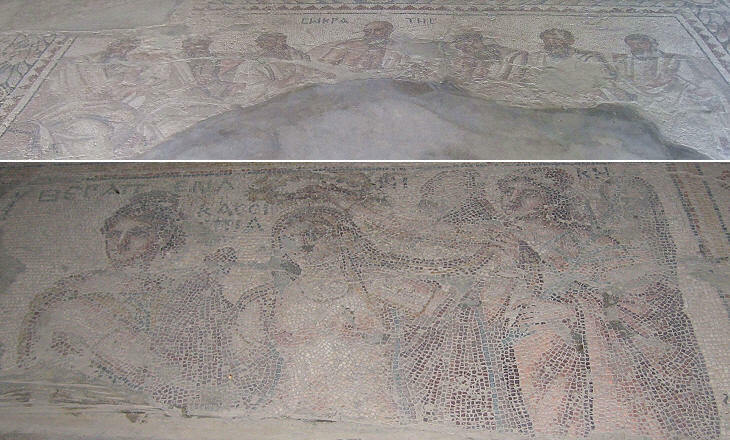 A second mosaic shows the persistence of the Roman myth in the region in the VIth century. 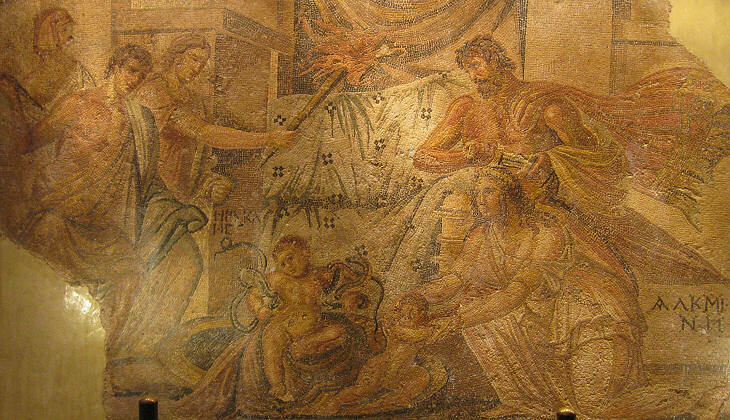 The image used as background for this page is based on another Roman mosaic portraying a mythological creature.